Active adults need 7-8 hours of sleep every night. There are 5 stages of sleep that your body and brain go through for each sleep cycle, starting from light sleep to deep restorative sleep and finally dreaming (REM). These stages of sleep result in one sleep cycle which is about 90 minutes to 2 hours. Under normal sleep behavior conditions you will go through approximately 4 cycles a night to feel rested in the morning. The last 2 hours of a full night of sleep (7-8 hours) is the most important for allowing the brain to store new information. As a college student, quality sleep is critical for your brain to function at it's highest academic performance and for overall well-being. 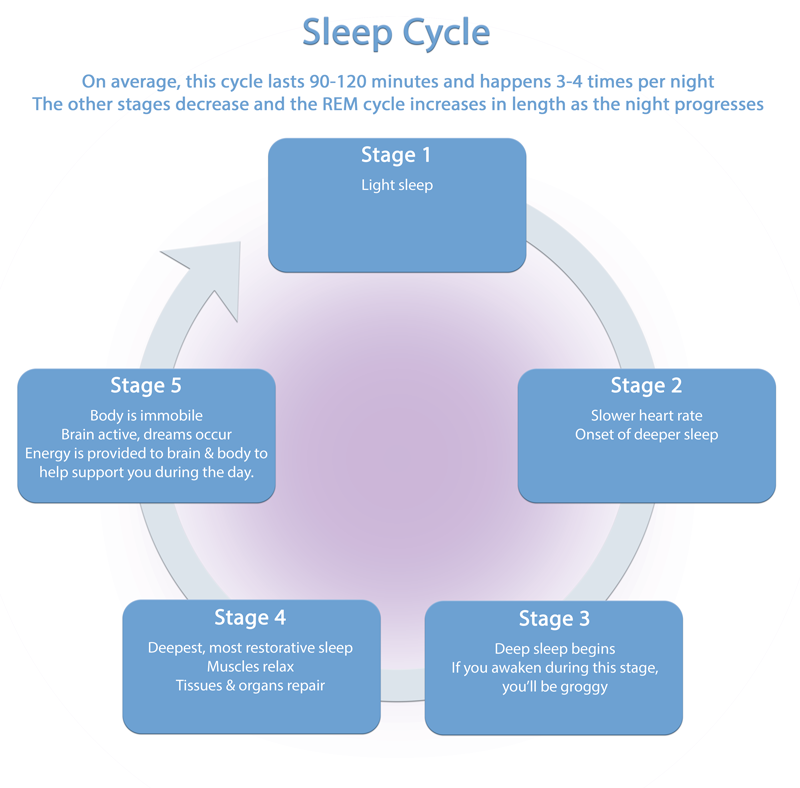 All of the stages within one cycle of sleep (shown below) are necessary for quality sleep.This cycle repeats itself 3-4 times per night, every 90-120 minutes. Anything that disrupts the sleep cycle, such as alcohol, ruminating thoughts, noise, light, will affect sleep, whether it’s duration or quality. For appointments, with our certified health education specialist, please email Glenda Pape.